My friend Tom wanted to run 100 miles in one day. 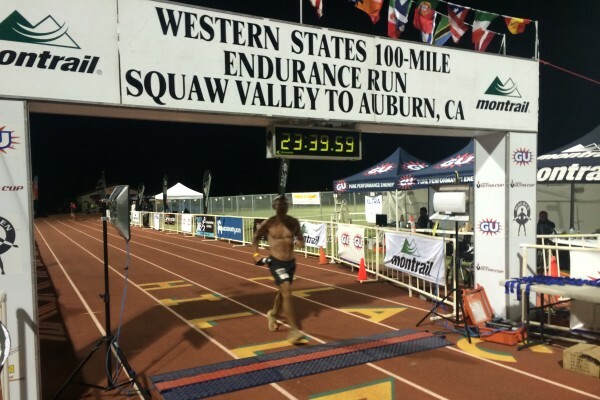 Only those who can cover the 100.2 miles from Squaw Valley to Auburn, California, in under 24 hours receive the coveted Western States silver buckle. Tom is no ultrarunning newbie. He has many 100-mile finishes, including two previous finishes at Western States, though that silver buckle remained elusive. I was honored and, frankly, a little nervous when he asked if I wanted to pace him. After all, I have yet to run my own 100-miler (to be remedied on July 19, 2014, on the Tahoe Rim Trail.) That being said, I did learn the art of pacing from my dear friend and 100-mile superstar Betsy Nye. I told Tom that I was in shape to pace the whole 40 miles, and he actually took me up on the offer. I got a jump-start on pacing duties as Tom spent the week before the race at our Truckee home at 6,500 feet. I read iRunFar.com’s excellent article on “The Western States Killing Machine” and realized that I needed to help maintain a calm environment, even at the house. 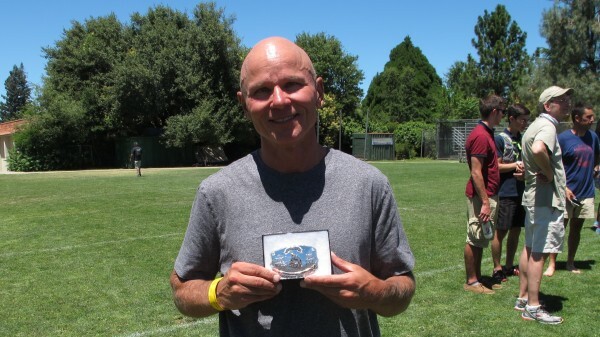 Tom’s goal for WS 2014 was clear: to earn a silver buckle by finishing in less than 24 hours. He told me that he really wanted it. I asked him if he wanted it to be his most difficult physical feat ever. He said yes. He wanted to give it everything. I took note and planned to remind him of that later. Tom had a pace plan based on his previous race performance, training runs on the course, and the published “24-hour” splits. It was a smart plan that put him 40 minutes behind the published 24-hour splits at Bath Road (mile 60.6). The plan called for him to slowly make up the difference in the back half of the race. It was smart, but also very nerve-racking. Tom wore a GPS watch and Pacelet (my homemade pace bracelet) until I picked him up after mile 60. I wore a different Pacelet for the back 40 miles and a fresh GPS watch. “No Whining” was Tom’s rule for himself, and I was happy to help him comply. Fortunately, he’s not much of a complainer to begin with. We both heard Jeff Browning‘s talk at Alpenglow’s Mountain Festival. 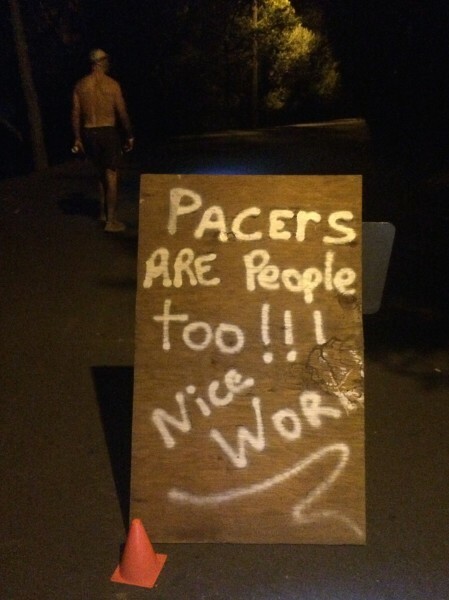 Jeff explained that one reason he didn’t always use pacers is that they give you an unneccessary opportunity to whine and generate negativity. This is my rule, as taught to me by Betsy Nye. Simply put, if the terrain is flat or downhill, then we will at least shuffle. “Shuffle” is what you ask your runner to do when “running” is too painful to fathom. I drove Tom to the start on Saturday morning. After seeing the runners off, I had the luxury of returning home for a nap before my pacing would start. Another friend would crew Tom in the meanwhile. I woke up from my nap a couple of hours later with that sick feeling that happens when solid sleep has been interrupted. I immediately picked up my phone to track Tom’s progress and found his aid station splits to be spot-on – even a few minutes ahead of his plan. Calm went out the window. Nerves and excitement took over. I was very close to vomiting. “It’ll pass,” I told myself. And it did. Coincidentally, at this very moment, Tom’s crew texted me that Tom was having stomach problems. “It’ll pass,” I texted back. Crew and pacers are allowed to drive to Foresthill (mile 62), but may also walk 1.4 miles down to the Bath Road Aid Station (mile 60.6). I met Tom at Bath Road right on schedule. He was hot and tired. His stomach was not doing great, nor were his legs. We hiked back up the road to Foresthill and I called the crew to bark instructions: Have the chair ready. Someone needs to rub Traumeel on his legs. Tighten his shoes. Prepare the caffeinated Tailwind sports drink. I made the mistake of not better managing Tom’s body temperature. We should have cooled him with water and ice, but it took me an hour or two to realize that he was still overheated, despite the setting sun and his shirtless back. We left Foresthill perfectly according to plan at 7:20pm. It was time to hit our stride; find the balance between fast enough to make up the 40 minutes in Tom’s pace plan but not so fast as to blow the legs. It was delicate. The legs were already close to blown. The overheating was contributing to stomach issues. How would he keep down the calories, fluids and salts? Baby sips. Constant but tiny sips of the magical Tailwind sports drink could cover all three needs. Tom’s hopes for a silver buckle waned, but I still had faith in his pace plan. We just focused on each next aid station and he dutifully followed the rule: don’t give up free speed. And then there was the puking. It was brief and impressive. Like a frat boy who vomits between drinking games, Tom returned some liquids to the side of the trail, barely wiped his mouth, and then continued hiking up the road. Wow – that’s some serious mental grit! Our aid station stops were expedient but calm. Tom continued to worry about the viability of a sub-24 finish. 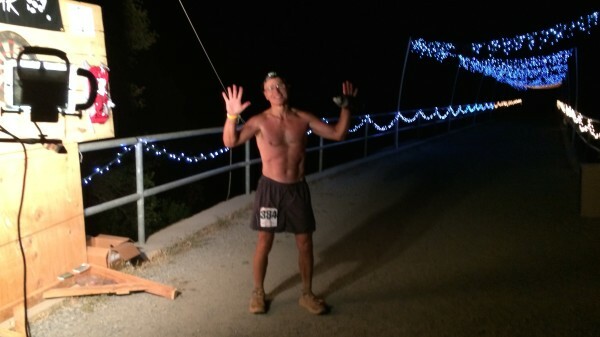 I convinced him that as long as we made it to the river (mile 78) by 11pm, the silver buckle was still happening. I have to admit that I shared only limited pace and timing data because it was stressing him out (even if he couldn’t recognize that fact). I know that made him mad, but I’m glad that he somehow trusted me and the plan. Meanwhile, his legs were on the brink of destruction, but he kept shuffling. I assured him that they would feel better after the cold plunge of the river. We arrived at the river at 10:52pm, and the cold plunge felt like heaven to me. Not so much to Tom. Nonetheless, arriving at the river “on time” was a giant mental boost and his legs were moving better, even if that wasn’t apparent to him. Tom came out of the river quite cold, but recovered quickly on the climb to Green Gate (mile 79.8) I think this is where he puked again. Right in the aid station. It was after two cups of Coke and a cup of broth. Uhhg! Only one cup of anything from now on! The next section was hard-fought, but Tom kept pushing. He was taking only little sips of Tailwind and occasional food such as one Honey Stinger chews or a single sip on a GU gel (just a tiny swallow at a time). Since the Tailwind provides ample salts, I didn’t dare let him take an electrolyte pill, for fear that it would further aggravate the stomach issues. We came into Brown’s Bar (mile 89.9) at 2:04am, ten minutes ahead of Tom’s plan and only 4 minutes behind the official 24-hour historic pace. The heat of the day had waned and Tom was moving better since the river plunge. And here I again had confidence in the plan. I fully expected a sub-24 finish. We crossed Highway 49 (mile 93.5) and stopped briefly at the aid station. According to UltraLive, we apparently passed eight runners in the 3.3 miles (mostly) down to No Hands Bridge. 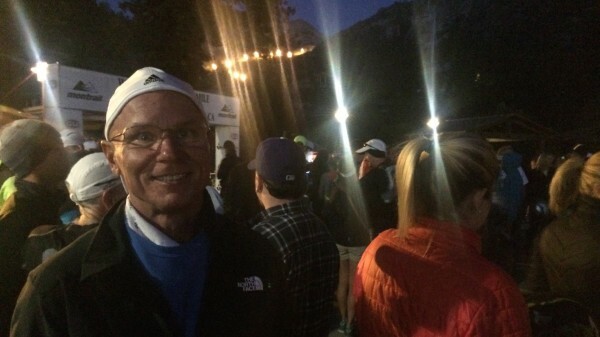 Tom was now 25 minutes ahead of the official 24-hour pace. We stopped for a photo op on the bridge. But nothing is given and the climb up from No Hands was difficult. Very difficult. Tom cooked and wanted to let up once he felt his sub-24 time was secure. I admitted to him I wanted to see him finish in 23h 45m. Who really wants to finish with just one minute to spare? My adrenaline took over and I pushed Tom a little too hard up the hill. He was far enough behind that I couldn’t hear his labored breathing. He had to finally chime in, “Really. I’m serious. You are going to kill me.” I felt awful and we backed off significantly. The final 1/2 mile stretch to the high school track is flat to downhill. I didn’t expecting any running, but I suggested just in case: “Let’s shuffle.” And then, to my surprise, Tom ran like the wind onto the track – my GPS shows that last section at an 8:30 min/mile pace. It was his hardest run ever and he gave it everything. My own training for the Tahoe Rim Trail (TRT) 100 is substantially done. I will carry Tom’s mental grit and determination into my first 100-miler. Tom’s pacing strategy was textbook and his execution of it was spectacular. I couldn’t be happier for his accomplishment or more proud to be part of it.